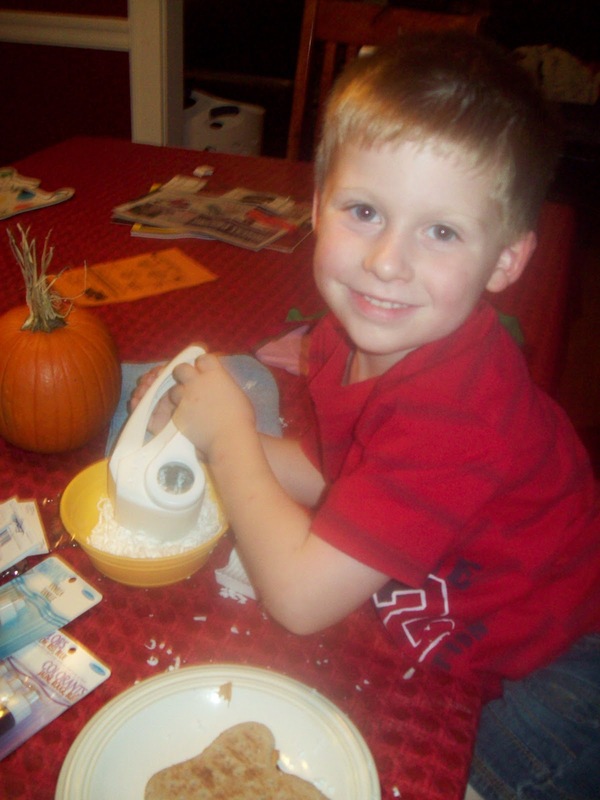 Re-Writing Motherhood: The Top Secret Christmas Craft For 2011 Revealed! The Top Secret Christmas Craft For 2011 Revealed! 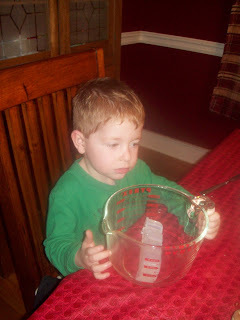 I found the idea here at alphamom.com.﻿. 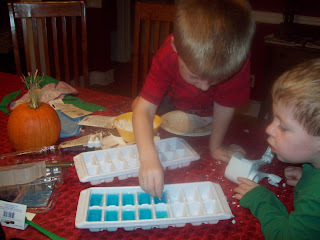 The author, Brenda Ponnay, gave great directions, and the boys and I had no problem making the soap (for the most part). Want to avoid making the mistakes we did? Read on. While I got our materials together and cut the block of glycerin with a knife, I kept Sam busy by letting him grate white Ivory soap (snow) with the cheese grater. As you can see, he was very happy with his job. The next step was to add dye and perfume to the soap. The vanilla scent was great. No problems there. Then I added two drops of blue dye the first batch of glycerin, and it was a little too blue. For the next batch, I only added one drop of blue and it looked much better. Lesson learned. I had gone into this project guns blazing, ready to make perfect soap, but without any soap making experience between the three of us, it became clear to me that what we really needed was a soap-making practice run. 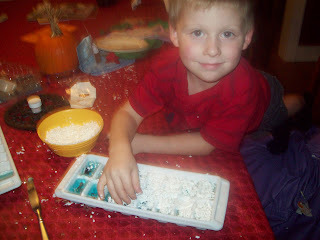 Once the toys were inside, Sam added a later of freshly-grated snow, and I poured more melted glycerin on top to seal it. Very quick and easy. Except it was about this point that I realized I'd forgotten to added any soap glitter to the soap (which needed to happen before it went in the ice cube trays). *sigh* Again I reminded myself: practice run. We put the trays in the freezer to harden for an hour or so, and with the help of a knife, they popped out of the tray very easily. Unfortunately, the soap was not completely clear, and only the buttons we'd placed very close to the outer edge of the "snow globe" showed up well. 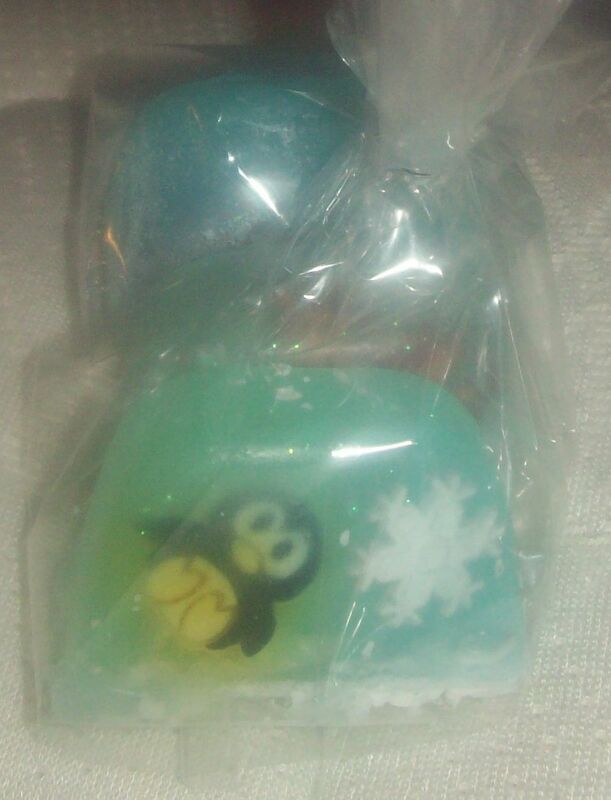 This was disappointing, because the snow globe effect is much better if you can see the objects inside the soap. Of the 14 snow globes we made, only 2 or 3 turned out well, so we had to make another batch. Luckily, as crafts go, this one is not expensive. It's not long and involved either, so we whipped out another (perfect) batch in no time. They turned out really cute, and the boys enjoyed playing with the imperfect soaps in the bathtub.